Half of all Americans are worried about their weight. Unfortunately, the deck is stacked against these people as studies have shown that up to 98% of dieters will regain all of their weight in just 2 years. We all know people who have beaten the odds. These “outliers” have somehow lost the weight and kept it off. What secrets can we learn from these outliers that will help us to maintain a healthy weight? In 1994 researchers Rena Wing from Brown University and James O. Hill from the University of Colorado were convinced that there had to be more people who had successfully lost and maintained their weight loss. T hey also wanted to understand what were the most important factors to successfully maintaining a healthy weight. This collaboration led to the formation of the National Weight Loss Registry. They advertised widely and have now collected a group of 10,000 people who have lost an average of 66 pounds and have successfully kept that weight off for 5.5 years. From these 10,000+ outliers they have published many scientific studies. The key message from the National Weight Loss Registry is that successfully keeping weight off is very possible. With a few simple techniques we can all maintain a healthy weight! I should point out that in this article I am defining successful weight loss as intentional weight loss. Often, people may experience significant unintentional weight loss. If this occurs, physicians need to know immediately as this could be a sign of a significant hormonal or metabolic abnormality or even an undiagnosed cancer. Study after study has shown that the secret to maintaining a healthy weight is to exercise about an hour a day. Data from the 10,000+ successful people in the National Weight Loss Registry also showed the same thing. Of these 10,000+ people, 90% of them reported exercising an hour a day as their strategy to keep the 66 pounds off for more than 5 years. The main exercise reported by these people was brisk walking. I realize that in our hectic lives it can be very difficult to carve out an hour each day to exercise. 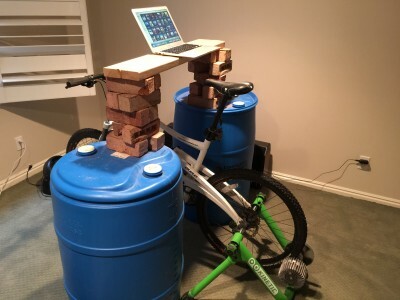 For me, this is why I use my treadmill and bike desks everyday (see photos). This allows me to multitask so that I can both maintain a healthy weight and get my work done simultaneously. Other ways to get in the hour of exercise while doing something else could be to bring a treadmill or stationary bike into your front room. This can be a guilt free way to watch TV. I also love a good book. I have found that listening to books through Audible on my iPhone is a great way to “read” books and exercise at the same time. If you are the type that does not have an hour to spare and would rather not exercise while doing something else, some studies report that high intensity exercise works just as well. Thus, you could maintain your healthy weight by turning the intensity dial up. While exercise has been shown to be the number 1 factor in maintaining a healthy weight, I need to point out that exercise alone is rarely effective as a weight loss tool. The reason is that to even burn 1 pound of fat (3,500 calories) it would require an enormous amount of exercise. To put this into perspective let me give you an example. If I ran a 4 hour marathon (26.2 miles) I would only burn 2,852 calories. All of the effort in running a grueling marathon would not even burn 1 pound of body fat. Thus, for weight loss eating the right foods in the right amounts is critical. Once we get down to a healthy weight then exercise is critical to maintain the weight loss and avoid becoming part of that 98% that gains the weight right back. In Mary’s case, her yo-yo dieting ended when she finally resolved to completely kick the sugar and processed food habit. In addition to eliminating the sugar and processed foods it was also important for her to completely eliminate all simple carbs. She made a simple rule that she would not eat anything that had a glycemic index of more than 50. In addition to these simple dietary changes, she also committed to an hour of exercise each day. This was the more challenging part for her as she had to change her daily routines and make some new friends to maintain this exercise habit. These changes were made 3 years ago and she has not gained 1 of her 50 lost pounds back! She is proof that it is not difficult to maintain weight loss. There is much more we can learn from the 10,000+ success stories in the National Weight Loss Registry. Here are the 5 main strategies used by these people. As mentioned, 90% of these successful dieters exercised about an hour a day to keep the weight off. The main form of exercise reported was brisk walking. Fully 98% of the people in the National Weight Loss Registry reported that their diet had forever changed. I have found that for many people, just getting rid of sugar and processed/prepared foods is all that is required to get down to a healthy weight. Eating breakfast was reported as a successful weight maintenance strategy in 78% of the people. If you are not a breakfast person, you can still maintain a healthy weight as 22% of the people in the registry did not regularly eat breakfast. Weighing yourself at least once a week was reported as another key to success in 75% of the people in this registry. While we can rationalize all we want about how we look, the scale doesn’t lie. The scale can be a periodic “reality check” to make sure we are still on the right track. Interestingly, 62% reported limiting their TV time to less than 10 hours per week as a successful strategy to maintaining a normal weight. To me, this means limiting the time you sit. It is not just the TV but this would also apply to movies, surfing the internet, etc. What strategies have worked well for you to maintain a healthy weight? Do you agree with the 5 strategies reported by the 10,000+ successful people in the National Weight Loss Registry? Please work under the direction of your physician if you are trying to lose or maintain a healthy weight. They can help to guide you and monitor your progress to minimize the risk of any problems that might arise from your efforts.